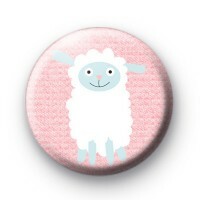 Pink Easter Lamb button badge. This 25mm badge has the cutest Fluffy White Sheep in the middle. It is adorable and would make the sweetest party favours from your Easter Party or Easter Egg Hunt this year. Kids love to wear badges and we have so many fun Easter & SPring themed badges in the shop. They make fun handmade alternative Easter gifts ideas. We've lots of fun Easter bunny badges, Easter slogans and of course cute yellow easter chick designs too. So be sure to take a look at our Easter badge category down the left-hand side.